Scott Speed and Volkswagen Andretti Rallycross (VARX) become the first team and driver champions in ARX. This is the fourth driver championship in rallycross, in a row, for Speed and the team’s fourth collectively.In ARX2, DirtFish Motorsports driver Conner Martell won the second semifinal to lock down the ARX2 championship. In the final, he took the hole-shot from the pole position into turn one while Dreyer & Reinbold Racing’s Christian Brooks was forced out wide, allowing DirtFish’s Fraser McConnell and Keatts Motorsport’s Cole Keatts to move up. McConnell climbed into the lead when Martell was forced out on lap two by a puncture, but it was Buhl Sport Detroit’s Alex Keyes, who had taken the joker on the first lap, who moved forward to sweep the weekend at COTA with a pair of victories. Jamaica’s Fraser McConnell finished second and 18-year-old Brooks finished third. Martell and DirtFish Motorsports secured their first championship in rally or rallycross. The official rally school of ARX secured the team championship with consistent performances from its drivers, Scott Anderson, Fraser McConnell and Scott Anderson. After winning the ARX round at COTA last month, Speed notches another victory in Trois Rivieres. he Americas Rallycross (ARX) series inaugural season is shaping up nicely. 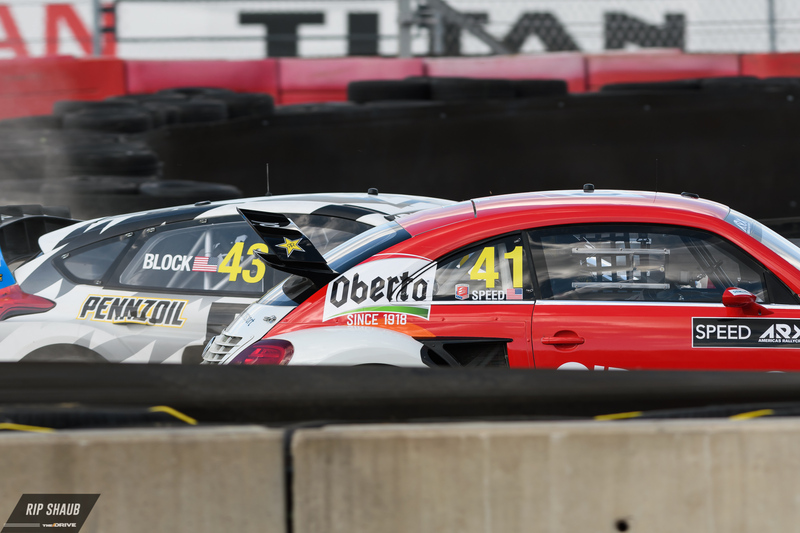 The first season is rather short at only four rounds, and on Sunday, the third event of the championship calendar brought the competitors to Trois Rivieres, Canada this weekend for GP3R. GP3R can trace its roots back to 1967 when members of Club Autosport Mauricien organized a race on the streets of Trois-Rivieres in Quebec. Since 2014, the race weekend has featured the FIA World Rallycross Championship and now, in 2018, it also hosts the fresh ARX series. Driver of the No. 41 Oberto-sponsored Volkswagen, Scott Speed took the top spot at Round 2 of ARX at Circuit of the Americas and he followed up by grabbing first place in Canada. His Andretti Autosport teammate Tanner Foust took second place, while Head Hoonigan Ken Block nabbed the final spot on the podium with a P3 finish. After Round 3, Speed has solidified his championship lead over his teammate with 86 points to Foust’s 77. Subaru Rally Team USA driver Patrik Sandell is sitting in third place with 58 points. Block, while grabbing second place at COTA and third in Canada, is sitting in fourth place overall with 49 points mostly due to only racing select events this year as he sat out the first round at Silverstone. Chris Atkinson rounds out the top-five with 49 points, the same as Block. The next and final event of the 2018 Americas Rallycross Championship inaugural season will bring the drivers back to Circuit of the Americas on September 29-30. Check out what went down as Mother Nature soaked the track for Red Bull GRC in Washington D.C.
“Yes! We finally win here!” said an enthusiastic Speed at the finish. The result moves him into second in the points, just six points behind his teammate Foust with four races remaining in the 12-round championship. Speed scored a perfect weekend, earning the top qualifying spot and winning both heats and the semifinal round on the way to his second victory of 2016. He also won the race at MCAS New Riverearlier this month. He made it look easy, but the weekend wasn’t without its challenges throughout the field. Early racing was uncharacteristically rough, with Sandell nosing into a tire pack in the first heat of the weekend, teammates-turned-rivals Brian Deegan and Steve Arpin colliding through the first corner and collecting Subaru’s Bucky Lasek in a Round 1 pileup, and Nelson Piquet Jr., back in the series for the first time this year, slamming the wall during qualifying before setting a fast lap. On Saturday, all cars were back on track and performing well when weather swept through the nation’s capital, leaving the track slick and muddy for the main event. And with a significant shortcut available from the joker and the placement of the big dirt jump on the last corner, the on-track action was intense.In semifinal racing, Sandell saved his joker for the last lap and nearly stole the lead from Foust. In the final, Sandell trailed a smooth and fast Speed to the checkered flag while Foust and Deegan ran door-to-door for most of the 10-lap race. Fans were on their feet as the longtime rivals Foust and Deegan diced back and forth, with Deegan holding off multiple attacks from Foust. On the sixth lap, a hard-charging Foust spun out but recovered to resume the challenge for the podium. Foust finally found a way past Deegan on the final lap and stole the final spot on the podium.The Red Bull Global Rallycross championship continues in Atlantic City, August 28. Speed earns his first GRC championship, with a third-place finish, and the inaugural crown for Volkswagen Andretti Rallycross In the glow of the iconic Las Vegas strip, Scott speed and the Volkswagen Andretti Rallycross (VARX) celebrated the 2015 Red Bull Global Rallycross (GRC) championship after a frenetic season finale that saw mother nature wreak havoc on the season-ending track. The third place finish for the driver of the no. 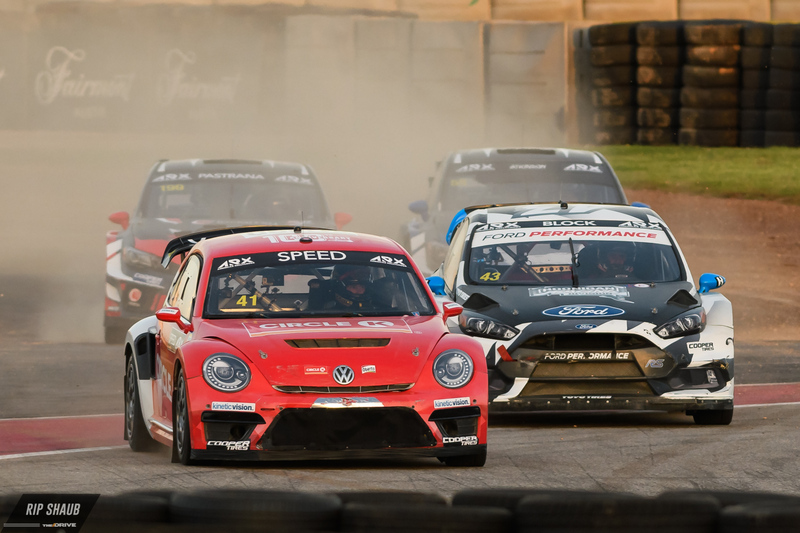 41 Orafol Volkswagen beetle GRC secured the championship win, earning the Volkswagen Andretti Rallycross team its first championship victory; in only its second season of competition. Tanner Foust earned a third place finish in the championship standings, adding to the incredible performance of the VARX team for the 2015 season. “i’m at a loss for words when it comes to describing how it feels to Win the championship this season,” said Speed, soon after crossing the finish line in Vegas. “the whole Volkswagen Andretti Rallycross team has worked so hard for this result; I’m Incredibly proud of this team and am so happy to have been able to bring home the top spot for them.” Tanner Foust added to his extensive resume of global Rallycross Achievements by claiming third place in the 2015 championship standings, with a ninth-place finish in Las Vegas. After contact with the wall on lap one of the final, Foust managed to pilot his No. 34 Rockstar energy drink Volkswagen beetle to the checkered flag in ninth place, securing command of the 2015 championship podium. “it was a difficult event here in Las Vegas, but i’m so proud of the entire VARX team for the efforts they’ve put in this year. They’ve made our season so, extremely successful,” states Foust.“third in the championship obviously isn’t what we were hoping for, but I can’t wait to start next year, continuing the success we’ve found in 2015. Congratulations to Scott—i’m glad he could join the GRC champions club, but we’ll be gunning for him next year!” With five victories in the 2015 season, Volkswagen Andretti Rallycross surpassed all other teams, in only its second year of competition. The first full year of running for the Volkswagen beetle GRC proved the platform’s competence, reliability, and Speed; earning the iconic model its place in the Global Rallycross record books. Orafol Americas inc., a subsidiary of Orafol Europe GmbH, is a leading global manufacturer of premium vinyl graphic products, reflective solutions and adhesive tape systems used in the signage, graphics, industrial and traffic and safety applications. The company’s distribution network spans the united states, Canada, Latin America and the Caribbean. About Volkswagen of America, inc. Founded in 1955, Volkswagen of america, inc., an operating unit of Volkswagen group of america, inc. (VWOA) is headquartered in Herndon, Virginia. It is a subsidiary of Volkswagen Ag, Headquartered in Wolfsburg, Germany. VWOA’s operations in the United States include research and development, parts and vehicle processing, parts distribution centers, sales, marketing and service offices, financial service centers, and its state-of-the-art manufacturing facility in Chattanooga, Tennessee. The Volkswagen group is one of the world’s largest producers of passenger cars and Europe’s largest automaker. VWOA sells the Beetle, Beetle Convertible, CC, EOS, E-Golf, Golf, Golf GTi, Golf R, Golf Sportwagen, Jetta, Passat, Tiguan and Touareg vehicles through approximately 652 independent u.s. dealers. Visit Volkswagen of america online at www.vw.com or media.vw.com to Learn more. Based in Indianapolis and led by racing legend Michael Andretti, Andretti Autosport boasts a wide racing portfolio rooted in tradition and designed for success. Together with Andretti Formula E and Volkswagen Andretti Rallycross, Andretti Autosport fields multiple entries in the Indycar series, Indy lights and the pro Mazda championship, along with entries in the FIA Formula E Championship and Global Rallycross. The company boasts four Indycar series championships (2004, 2005, 2007, 2012), two Indy lights titles (2008, 2009), one pro Mazda Championship (2013) and one USF2000 championship (2010) and has captured victory at the famed Indianapolis 500 three times (2005, 2007, 2014). To share in the Andretti story, please visit online at Andrettiautosport.com and follow along on twitter via @followandretti. The All-American racer finished race one in Los Angeles in the first position, ultimately bumping him into the third spot in the championship points hunt. The former Formula 1 driver set the fastest lap in the No. 41 Merchant First Beetle during this weekend’s doubleheader event at the Port of Los Angeles.